I'm reaching out to you today with a heavy heart. This weekend's horrific tragedy in Orlando hit really close to home, and I know it has touched all of us in one way or another. While we search for answers, grieve the victims and pray for their families, I want to assure you I am committed to fostering an environment at Florida State University that values diversity and inclusiveness. We are — and will continue to be — a community that is welcoming to everyone regardless of race, ethnicity, gender, sexual orientation or identity. I know you join me in celebrating our diversity because it enriches our academic environment and contributes to our sense of family. As president, it is that sense of family that has resonated with me the most as I meet with faculty, staff, students, alumni and friends of the university every day. There is excitement about where we are headed, and I’d like to share some highlights from the past few months. In early May, I spent a few days in New York City for the annual Noles in NYC event and the inaugural Women of Distinction Inspire Award ceremony. We showcased several of our arts programs and met with hundreds of enthusiastic FSU alumni. What a great event! 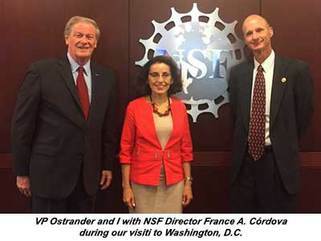 Vice President for Research Gary Ostrander and I traveled to Washington, D.C., on May 17 to meet with the director of the National Science Foundation, France A. Córdova. In addition to discussing a number of our NSF-funded programs, we updated her on the National High Magnetic Field Laboratory. We recently submitted a five-year renewal proposal, and we are looking forward to a site visit in late August. As you might remember, we learned last year we do not have to re-compete to keep the MagLab. This is validation of our good work as the home of the only national lab in Florida. During our trip, we also met with U.S. Sen. Bill Nelson and U.S. Reps. Gwen Graham, David Jolly and Ron DeSantis, and we took part in a D.C. alumni networking event. Everyone is optimistic about the future of FSU and our plans to advance our research mission! 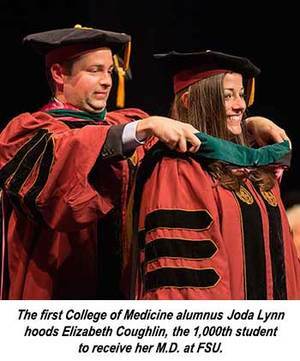 Back on campus, it was my pleasure to participate in the College of Medicine’s graduation ceremony May 21 and witness the hooding of the college's 1,000th graduate. It’s no secret that the medical school holds a special place in my heart, but we can all feel good that there are now more than 1,000 FSU-trained physicians working in our communities. This spring, we sent off thousands of graduates ready to make a difference in the world and soon we’ll be welcoming a new crop of students. Some freshmen will get a head start when the Summer C session begins June 27, including 410 first-generation students who are participating in the CARE Summer Bridge Program. I am so proud of this nationally recognized program. It has truly set a standard in higher education. I’d also like to give a warm welcome to our two new deans, who are starting in July. Erin O’Hara O’Connor has been hired to lead the College of Law. She is a well-respected legal scholar from Vanderbilt University. The FAMU-FSU College of Engineering has selected J. Murray Gibson as its new dean. Gibson comes from Northeastern University in Boston, where he was the founding dean of the College of Science. I’m happy they are now part of the FSU family! Last week, the Board of Trustees approved our 2016-2017 operating budget. I am pleased we continue to move in the right direction with efficiencies and cost savings that allow us to invest our resources in ensuring that our students’ academic experience is the best it can be. It was the first official meeting for two trustees — businessman and FSU alumnus Maximo Alvarez and FSU Student Body President Nathan Molina. I know they will bring energy and enthusiasm to the board as we move forward in raising the university’s national profile. We are doing great things at Florida State — and people are paying attention. Our faculty research continues to make headlines across the globe. 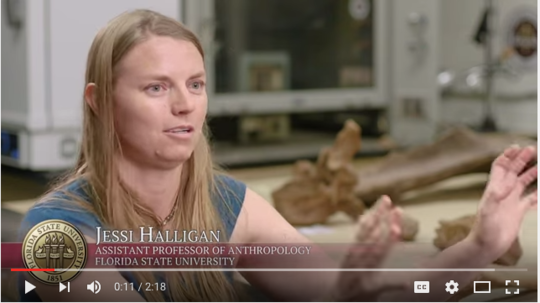 The latest example is the historic find in the Aucilla River by Anthropology Assistant Professor Jessi Halligan and her team. They found that humans settled the southeastern United States as many as 1,500 years earlier than scientists previously believed. The discovery generated hundreds of news clips around the world, and the video story about the discovery was the most viewed ever on our Facebook page! It was watched more than 300,000 times, and I have shared the link below. There are exciting developments like this happening every day on campus, and I’m so proud of all of your efforts in making Florida State such a wonderful place to learn and work. I love hearing about your accomplishments, so please feel free to email me when you have something you’d like to share. I’d also like to point you to my newly redesigned and updated website president.fsu.edu, which has an archive of my faculty letters as well as selected speeches and messages.